English rider Davey Lambert, 48, died Tuesday evening of injuries he sustained in a crash during the Isle of Man TT race over the weekend, race organizers confirmed. With Lambert’s death, the total fatalities toll on the race course run by Isle of Man TT is nearing 300. 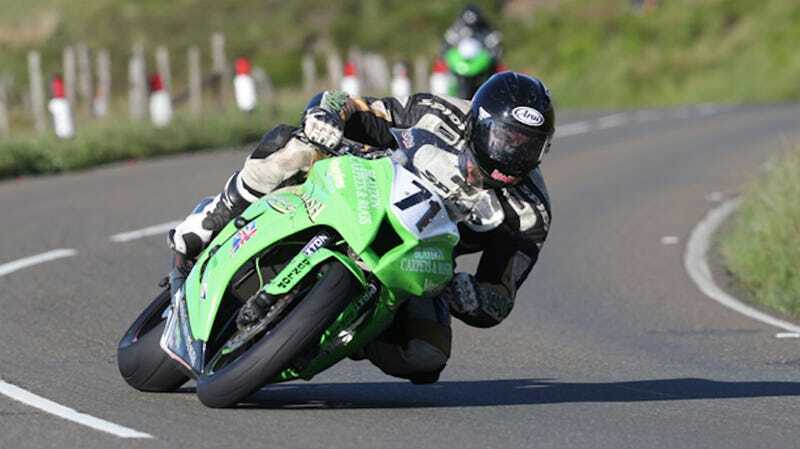 The race was Lambert’s Isle of Man TT debut, but a statement released by race organizers said he’s been racing on the Snaefell Mountain Course that the event uses since 2014. The fatal crash happened in the opening Superbike race, in which Lambert started 61st out of 69 riders on a Kawasaki bike. Lambert made it up to the 49th position by the end of the second lap, and crashed on the third. He was no longer listed in the running order from that point on, which appears to be the case with crashed-out riders. Jalopnik has reached out to Isle of Man TT in regards to that understanding, and will update if we hear back. Lambert’s death is one of hundreds since the Isle of Man TT races moved to the Snaefell Mountain Course in 1911, which has led to the race being regarded as one of the most dangerous there is. There are more than two competitor deaths a year on average; six people died 2011, and nine in 2005. A Facebook user who claimed to have witnessed Lambert’s fatal crash—the first he had “ever seen in 50 years of watching racing” on the course. He commented on the post, saying those at the scene “did everything they possibly could have done” to help Lambert. Following an on-site assessment of rider Davey Lambert’s condition shortly after his accident at Greeba Castle on the third lap of the Superbike race on Sunday, the medical team at the scene, in consultation with Clerk of the Course Gary Thompson, decided that the best course of action was to treat the rider at the scene immediately to stabilise his condition. He was then transferred by airmed to Nobles Hospital. Waved yellow flags were in operation throughout the area to ensure that riders went through the area at an appropriate speed.